On this road, which started some time ago in the Baliza section, it takes us to a stop in Zaragoza, to chat with the architect María Tejel (ETSAB 2009) and the designer Daniel Hernández. 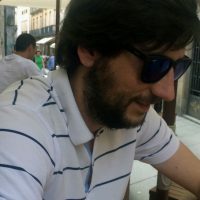 These young freelancers began to combine their work with the opportunity to create MyRetrobox,, a project to fight against that tireless and relentless adversary, time, against which the human being struggles since he is aware of it. In MyRetrobox are dedicated to design, create and distribute time capsules in which to preserve the experiences of key moments in the lives of people to enjoy them again in the future. 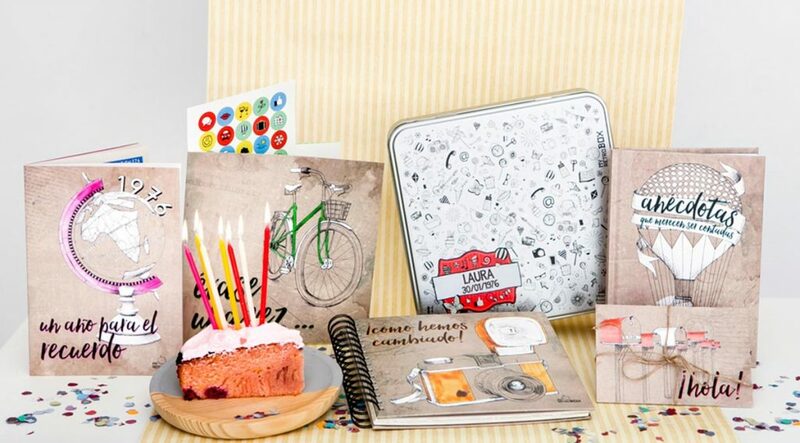 They are boxes of personalized souvenirs in which the best memories of important moments such as a birth, a wedding or a special birthday can be kept safely for direct delivery to the future. With no more time to lose, we leave you with the talk with María and Daniel. 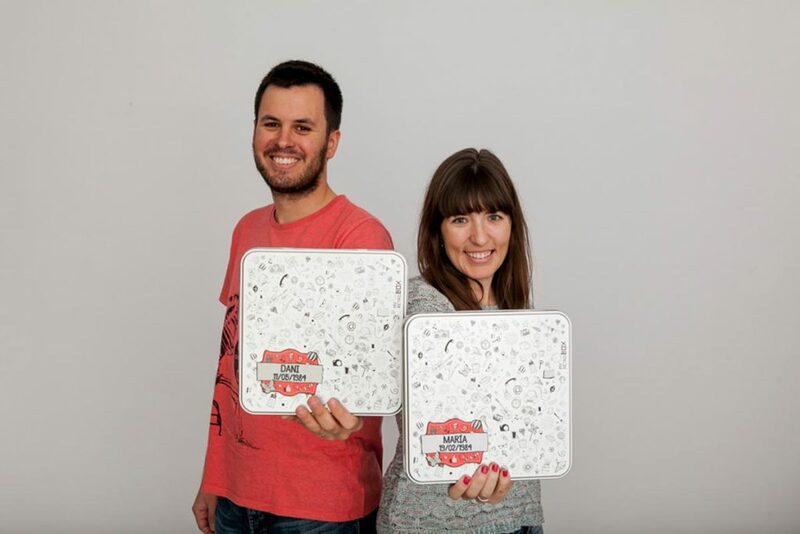 Daniel Hernández and María Tejel, creadores de MyRetrobox. If María Tejel opened one of your time capsules, would it have changed much? How would María Tejel define herself now? If right now I opened a time capsule closed by myself in the past, I would surely find many changes. Depending on the time in which it had closed (childhood, adolescence, university stage …) the changes would go in one direction or another, but I think it would be normal, since as we grow we are evolving. Surely they would be changes in terms of future expectations, some circles, some tastes, in certain ways of thinking … but I think I would not notice changed in the basics: values and personality. I would define myself as a restless, creative and enterprising woman. I’m a perfectionist and a hard worker. Also a little confused, more and more! In love with design, architecture and vintage objects that retain their charm of yesteryear. I love to travel, discover other cultures and, above all, collect good moments that become memories for the future. How, when and why does MyRetrobox arise? MyRetrobox is a project that I developed together with my husband, Daniel Hernández. He is dedicated to web design and online marketing. Before starting to work at MyRetrobox, we both had our activity as freelancers in our respective fields, he as a designer and I as an architect. Due to the economic crisis that especially affected our sectors and our personal situation, we decided to undertake a project of our own that we could (at least initially) make compatible with our professions. We gave it many laps for several months, however, we had not come up with an idea that motivated us enough to go for it. Finally, one night in 2012 we decided it was the day to find something firm from what to start working. Thinking about what we could and knew how to do, we came to the conclusion that an online store adapted very well to our situation and knowledge. Then, we brainstormed for several hours thinking about what we could sell and to which audience we would go. And finally, at the early hours of the morning we came up with an idea that excited us: design time capsules for babies. The next day we began to shape the idea, to look for suppliers, to design the product, to create the website … and finally, six months later, we put the first Baby Retrobox on sale. Did you encounter many difficulties? Which were the most problematic? We have some difficulties, mostly derived from the lack of time and budget limitation. When deciding to make it compatible with our professions, we did not have all the time necessary to create and grow the company at the speed we would have liked. We had to learn to organize and optimize our time, but still this circumstance made us move much slower than usual and made that today we still have ideas stopped at the table for years. At the same time, we decided to create the company only with our own resources and without getting into debt, so initially we had to take on all the tasks, even those in which we were not experts. This caused the quality of some areas to be affected. Little by little we have been able to invest the benefits to have other professionals in those areas where we needed it the most to improve the quality of the products and services. Another difficulty that we have encountered since the beginning and that we still notice today is how complicated it is to make yourself known on the Internet without a big budget. Although selling online you can access customers around the world and your store is open 24 hours a day, the competition is also much higher and if you just hang up the web on the Internet nobody sees it. Reaching customers is a long career and involves a constant effort in marketing and social networks. How did you detect the need for this service? The market for baby gifts is quite saturated with companies and options and competition is high. 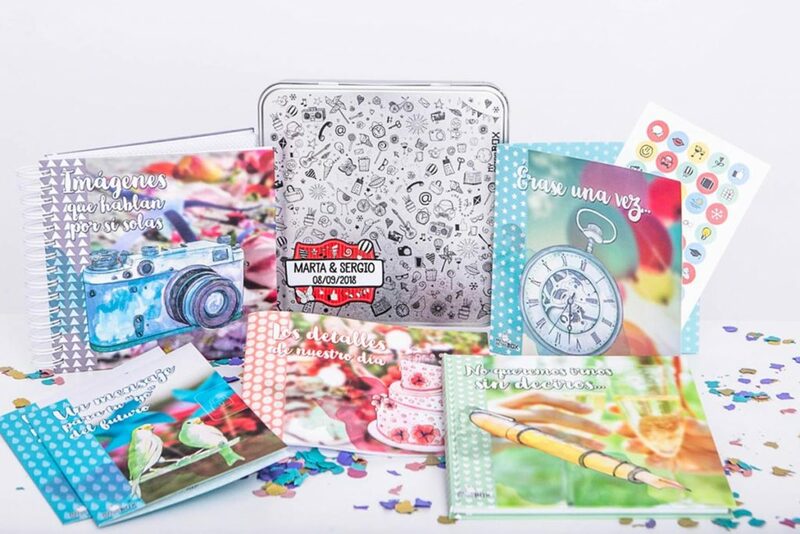 However, we think that it always has room for original ideas and that they bring something new, because among so many options we all look for “something else” when we have to make a gift to a baby, in a wedding or in a special event. With the MyRetrobox we give the possibility of making a different gift. Our time capsules are an original, personalized and emotional product that brings together design, current events, feelings, personal relationships, emotions, memories … In addition, it is a gift that lasts for a lifetime. They conquer in seconds the recipient of the gift, because after all, we are made of emotions. Baby Retrobox Baby Time Capsule. How is the day to day in MyRetrobox? Currently we are both dedicated exclusively to MyRetrobox, so in recent months we have been able to structure the work and divide the tasks performed by each one, although there are many that we still carry out between the two. Dani is responsible for the website, online positioning and marketing, while I’m in charge of stock management and supplier search, blog content and the design of some products. Between the two of us we prepare the orders daily, we think and develop the new products and take the customer service. In addition, in 2018 we have incorporated to the team a designer and illustrator who is helping us to take forward new ideas and products that will be seen throughout this year. How is the design, development and marketing process in MyRetrobox? We follow a similar process every time we decide to design a new product. First, we brainstorm about what the audience will be and the usefulness of that product and what elements it might contain. Almost at the same time, we request budgets to check if the content enters into price with the quality that we consider essential. In case we consider it optimal to continue with it, we begin to think about its design, colors, materials, illustrations … as well as to look for some references as a starting point. Normally this is the process that most dilates in time, since it took several months to reach a product that excites us both in design and quality. Once we have the product ready, we photograph it and make a video to show it on the web in an optimal way. Finally, once photographed, we add the product to our website and start marketing and dissemination tasks. Have you delegated functions and focused on specific parts of MyRetrobox? As I mentioned before, although at first we were the two of us who took care of all the functions, little by little we have been delegating tasks and hiring some services. It is impossible to be an expert in all areas that involve the management of a company, so it is important to have specialists in the sectors that you do not master. For example, although at the beginning we photographed the products ourselves, where we could, we started to go to the studio of a professional photographer to do them. In the case of an electronic commerce customers can not touch the product when making the purchase, so it is very important that the photographs show the product as it is and without deceiving the buyer, so this improvement was fundamental for us. What was (or will be) the critical moment once MyRetrobox has started? Although starting a business is always complicated, we were lucky that the product was very well received from the start and the initial launch was relatively simple. However, the critical moment has come later, when making the opportune decisions to grow the company. Once the product and the business model have been tested, it is really difficult for us to choose the best decisions for the company to grow in a sustainable way, being economically sensible but at the same time trying not to fall asleep or be overtaken by the competition. Time capsule for little boys and girls Peque Retrobox Communion. We do not have a specific reference, but we do try to avoid looking at large companies that have little to do with our business model and size and yet always set us as an example in books and conferences. We prefer to share experiences in person or through social networks with other small entrepreneurs (in many cases, also a couple) and with companies of similar size and philosophy to ours. Since our products are destined to very diverse events and people, from babies to couples celebrating their golden wedding, we no longer have a type of client, but are people of different ages and profiles. Of course, almost always are people who are used to the use of the internet and social networks. Our clients are usually men and women who have the need to make a gift at a special time and who are looking for something different for the occasion. 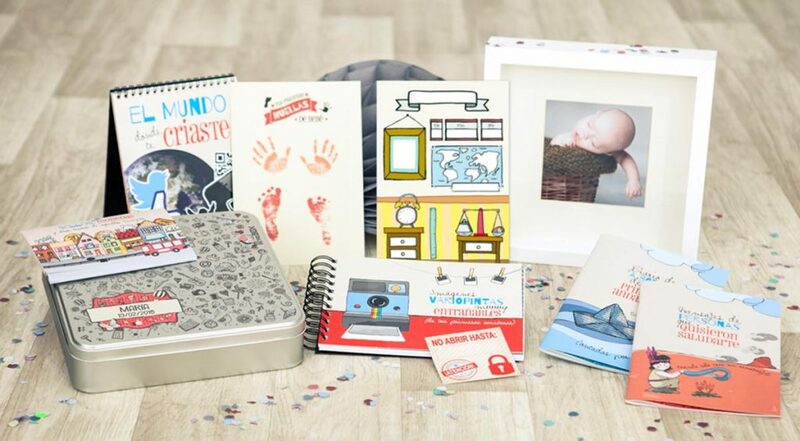 We mainly receive orders from MyRetrobox to give babies for their birth, first birthday or baptism, for boys and girls for their birthday or first communion, and to give to adults at their wedding, anniversary or round birthday. For the moment, in MyRetrobox we only sell through our website, so the network and new technologies are everything for us. Internet and social networks have given us the opportunity to reach our customers without a large economic investment, although with a great effort of time and creativity. In addition, due to the expansion of smartphones our customers make their purchase at any time and place and thanks to some applications such as WhatsApp or online chats we have been able to optimize our customer service. Time Capsule for weddings Retrobox Yes I want. Since we started our journey with MyRetrobox in 2012, my situation has changed. Initially, she combined it with a full-time job as an architect, which later became part-time. Later I was combining it with self-employed works in the field of architecture and now I combine it with specific collaborations in architecture studies. I try not to miss the job opportunities that arise as an architect, but not without first assessing the situation of MyRetrobox at that time and if we can afford my absence to develop other jobs. The architecture, has many battle fronts open (LSP, Bologna, unemployment, job precariousness, COAs, ETSAs, emigration, communication, etc. ), will not they be too many for the existing polarization within it? Actually, architecture today has many open fronts, but I certainly believe that responding to all of them is essential to adapt the profession to new times. Due to all the factors that you indicate, the situation has changed a lot in recent years and it is difficult to redirect it. However, this does not mean that we should remain standing and mourn, but that we have to adapt to all these changes and take them as an opportunity for transformation towards a better future for the profession. I think both architecture and the profession of architect are no longer going to be what they were in their day but, as I said before, we should not take this as something bad but as an opportunity to transform it into something better. “A country to be built”. However, now most towns or neighborhoods already have their civic center, health center, sports hall, school … in addition to the thousands of homes that have been designed and built. For this reason, I believe that the future of architecture is to give prominence to other fields that until now were in the background, as is the case of restoration or sustainable restoration. On the other hand, many architects will have to adapt to the new roles that are emerging and that go beyond the traditional architect we knew until now. In my opinion, it is fundamental to bet on technology in a firmer way than what has been done so far, starting with what they teach us in the University itself. The BIM methodology, Internet of things, augmented reality … the world is moving fast and our profession seems not to move as fast as it should, or at least not taking advantage of all the advantages that technology can offer. Time capsule for adult birthday Retrobox Happy Birthday. The fact that some architects are able to reinvent themselves and see beyond the path of the traditional architect seems to me an option worthy of admiration. I believe that finding and succeeding with a different path is not a simple task and with their example they help broaden horizons for architects or students who are trying to find their place in the profession. Yes, we are very satisfied with everything we have achieved so far. For the future in the short and medium term we have many ideas for new products to design and launch to the market, so we believe that our company still has a long way to go. While it is true that at some point I would like to return to work as an architect, I think I still have a lot to offer MyRetrobox. To finish, what would you advise current students and future architecture professionals? Architecture is a very vocational career, so if you have decided to study architecture because it is what you really want to dedicate yourself to, I would tell you not to surrender or discourage yourself because of the current situation of the profession. Even if it costs them, sooner or later they will find their place in it. However, they should keep their eyes and mind open and possibly have to be willing to move away from the figure they have traditionally known of the architect. In the race they give us a very versatile training and we acquire a great capacity for work, so they must take advantage of the skills acquired to find the place where they are truly comfortable. And of course, enjoy your days as students. With the maelstrom of deliveries and sleepless nights there are few moments to enjoy the race, however these are days that years later are remembered with much tenderness. Interview by Ana Barreiro Blanco and Alberto Alonso Oro. Thank María for her time and predisposition with this small space.